LE VAN MIEN | Geringer Art, Ltd. LE VAN MIEN (Vietnamese, 1873-1943). Le Van Mien was born in Nghe An in 1873. Trained as a Confucian scholar, he became one of the first Vietnamese students to study at the Ecole Nationale Superieure des Beaux Arts, Paris between 1891 and 1894. He learned to paint in the style of Dutch and German genre paintings, and also in a French Neo-Classical style. Upon returning to Viet Nam he taught in Vinh and also in Hue, and later became the principal of Imperial College. 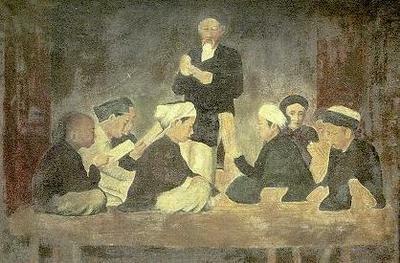 At one point he was a teacher of Nguyen Tat Thanh, also known as Ho Chi Minh. Van Mien is best remembered as being the first Vietnamese artist to master the European technique of oil painting.